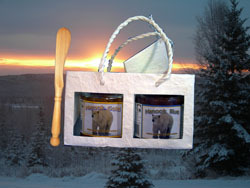 This gourmet gift bag contains your choice of any two mustards and an Alaska birch wood spreader. We were thrilled to find these handcrafted wooden spreaders made locally in Trapper Creek. They are carved from Alaskan birch wood to make a unique and beautiful addition to any kitchen. Our bags are made with paper handcrafted from the bark of mulberry trees. This centuries old paper making tradition sustains the people of remote Thai villages, as well as their forest. The process is environmentally friendly, sustainable and helps promote the future growth of these trees.